The official day of love is just around the corner! That’s right Valentines Day in Bali is here and if you’re planning to spend it with that special someone, you’ll be happy to know that Bali’s best venues have you sorted. 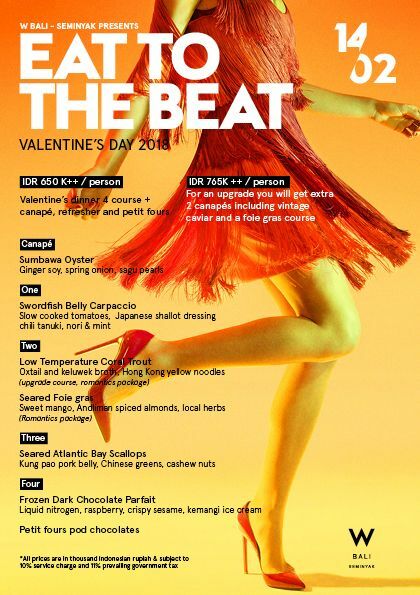 Romantic dinners and experiences await with these fantastic Valentines specials in Bali’s best destinations. Celebrate the taste of love at Seasalt, one of the places to be where you can spend a fabulous, flavourful time enjoying a five-course coastal menu, sparkles in a glass, a little sweet surprise, and of course, the ocean backdrop. Your romantic feast at Seasalt begins with welcome bread and foie gras butter. You’ll have cherry tomato sorbet shortly after as the amuse bouche, before the five-course feast is served. The impressive list of culinary delights, in that quirky Seasalt genre, starts with Cured Gindara (beetroot pickled, fuji apple, yuzu gel), and continues with Cray Fish (shoyu scallop, moshio kelp, tongarashi oil). Baramundi (crispy soy, cauliflower, pickled fennel) and Wagyu Striploin (shio kelp red prawn, sweet potato, as well as avocado wasabi. For the sweet finale, you’ll be served with Passion Coco (passion fruit, coconut parfait). IDR 1.500.000++ per couple. Want to add your own personal touch to your table this Valentines Day in Bali? They’ll make it happen! 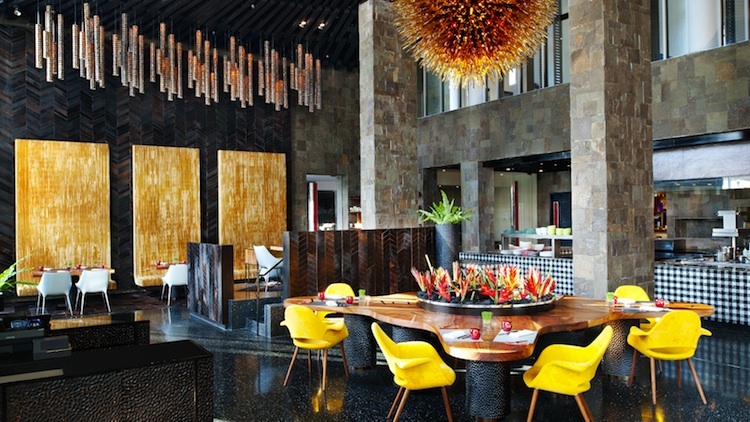 Embrace Valentines in Bali at The Anvaya in Kuta. Celebrate the day of romance at the resort with its Indian ocean breeze and sparkling sands at their Dinner by the Beach for only IDR 2,500,000++ per couple, inclusive of a four-course Set Menu, one bottle of sparkling wine, plus a beautiful rose to create an everlasting special memory. Or, let the acoustic music accompany your memorable moments with an exquisite sea view as the backdrop at Sands Restaurant Deck for only IDR 888,000++ per couple, including a three-course set menu, one glass of sparkling wine, a beautiful rose for her and a romantic table set up. Also, for only IDR 1,500,000++ per couple indulge in a romantic table set up on the balcony of a Premiere Lagoon Room with a three-course set menu, one bottle of sparkling wine and rose stem for her and discover a new way to create a memorable romantic dinner experience. Be captivated within the Bali Aga styled ambience and Balinese contemporary architecture of Kunyit Restaurant for an elegant Megibung dinner with your loved one while being serenaded by acoustic music. The Megibung with Love is available at IDR 599,000++ per couple inclusive of the Megibung Package, two glasses of sparkling wine and a special gift just for her. Make magical memories with an intimate dinner for two served in a private setting under the star-studded Bali sky at Maya Ubud. 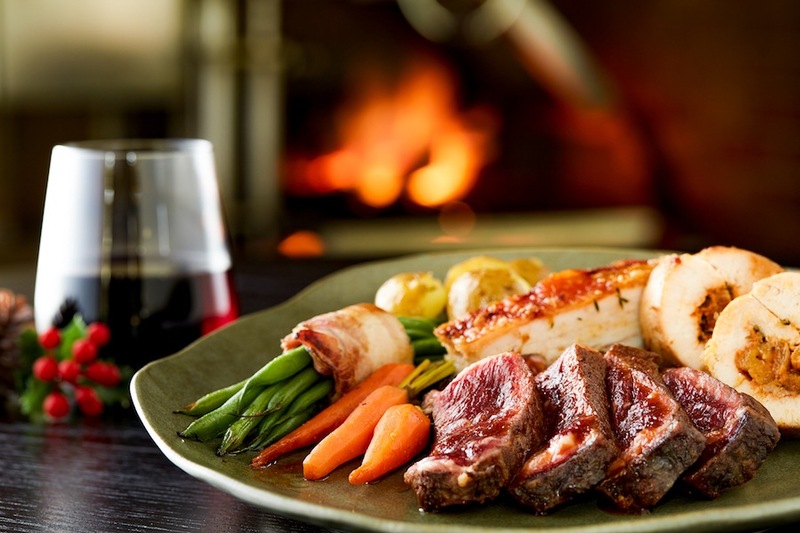 The resort lends itself to the spirit of love with a romantic dinner filled with personal touches. 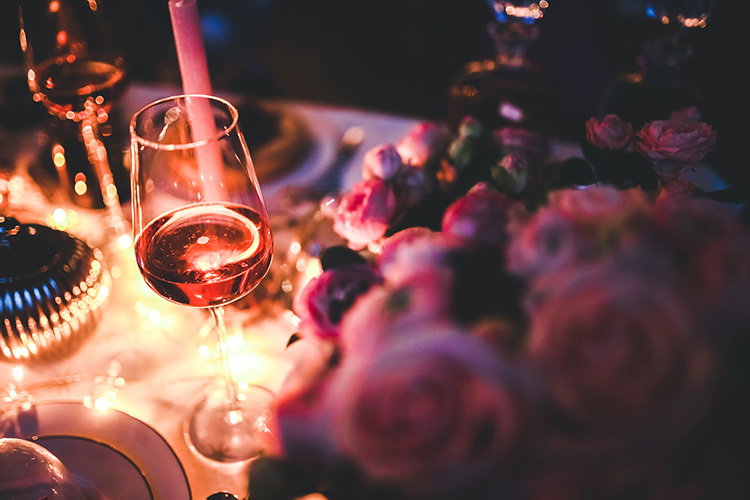 Wine and dine the evening away in a setting encompassed by glowing candles and fresh flowers, as a waiter tends to you as if you’re the only two people in the world. The dinner start at 7pm onwards. IDR 2,000,000++ per couple. Love is in the air at Anantara Seminyak. Celebrating the day of St. Valentine, the resort’s Wild Orchid Restaurant and MoonLite Kitchen and Bar have prepared a special Valentines Day in Bali set menu for lovers to celebrate the day of love. Wild Orchid Restaurant offers elegant-meets-casual, ocean view dining vibe; your table awaits in the comfortable charm of the restaurant’s dining room. If lounging is more your style, sink into beachfront daybeds, where you can be closer to the sound of the rolling waves and also watch masterful chefs do what they do best in the open kitchen. 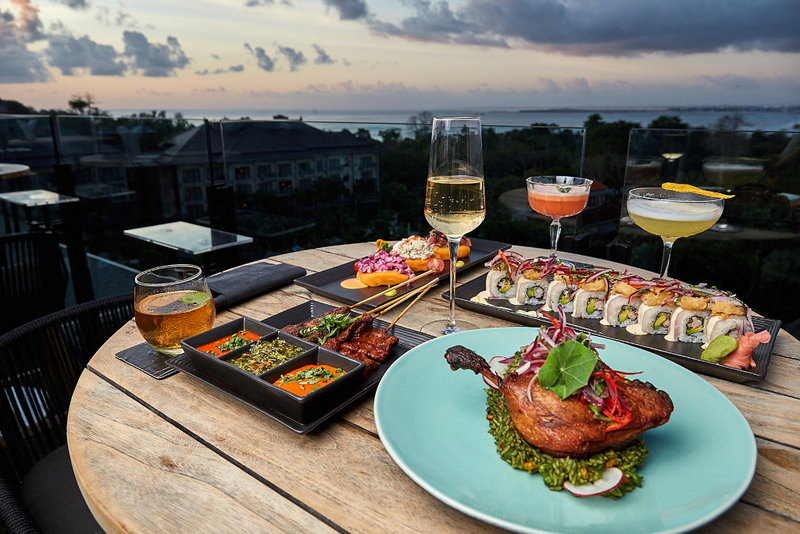 You also can opt for dining at the resort’s award-winning restaurant, MoonLite Kitchen and Bar, which is famously known as one of the best rooftop restaurants in Bali. Glance over wild waves and chic beach life from the open air deck. Four-course dinner here is available at IDR 595,000++ per person, the price is inclusive a glass of sparkling wine. Elevate your dinner experience by adding IDR 398,000++ per person for wine pairing. Spark up your romance at FIRE restaurant or go with the flow with the sound of the waves at Starfish Bloo. Enjoy an exclusive 4-course menu at either of these exquisite eateries, prepared with the finest ingredients for both land and sea. Starting at IDR 650,000++ per person, including canapés and petit fours. View the menu here. Available Valentines Day, 6pm-10pm. 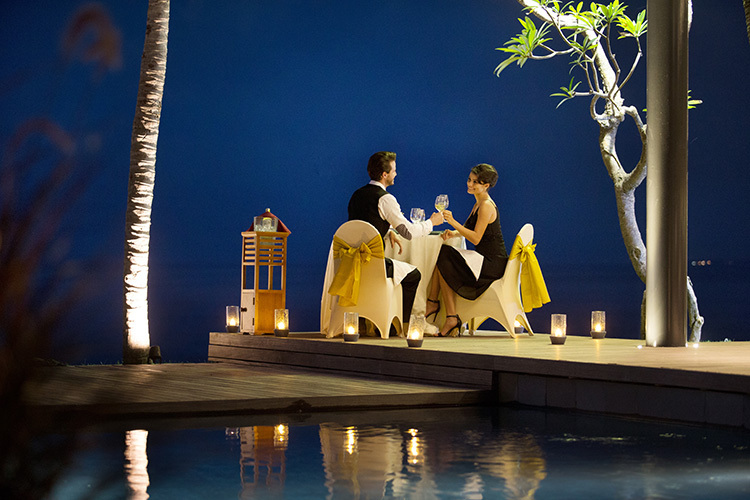 What would Valentines Day in Bali be without a romantic candlelit dinner? Even better if you can sit back and let someone else work some magic in the kitchen whilst you spend quality time with your loved one. Let the culinary team of Anarasa restaurant at Mövnpick Jimbaran tantalise your taste buds with an elegant six-course menu, featuring gourmet dishes such as foie gras, freshly shucked oysters, caviar, lobster, Wagyu beef and a sinfully rich Valrhona chocolate cake. Couples can choose to dine next to the glittering pool, in the garden gazebo or at the Pool Pavilion. As a parting gift, each couple will receive a box of chocolate pralines. IDR 2,850,000 per couple. 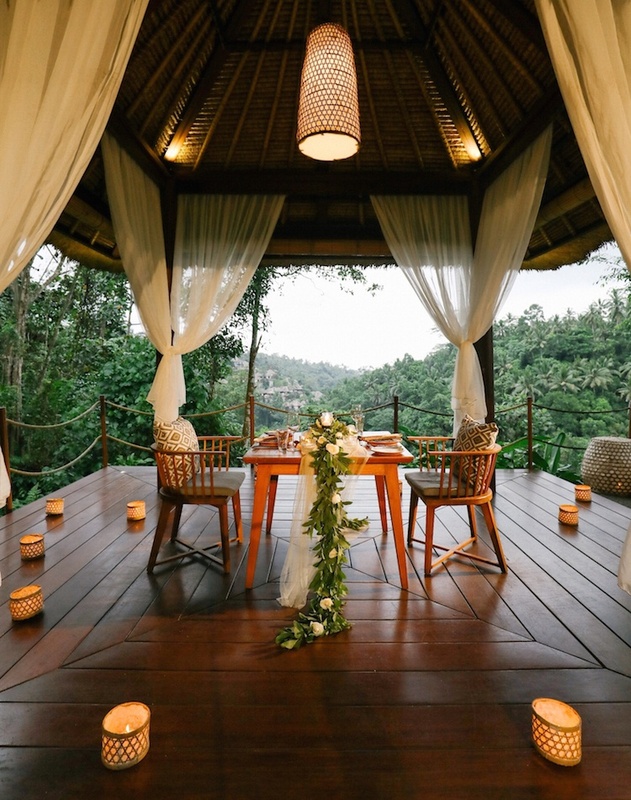 Discover one of the most romantic dining hideaways in Ubud – the Bale Bengong at Alila Ubud – a luxurious bale designed for two, cocooned amongst the lush rainforest, where you can dine on a seductive five-course dinner, surrounded by the beauty of nature and the distant ripple of the Ayung River. A separate lounge area provides a relaxing spot to cosy up and stargaze after dinner. A precious experience to share with that special someone. 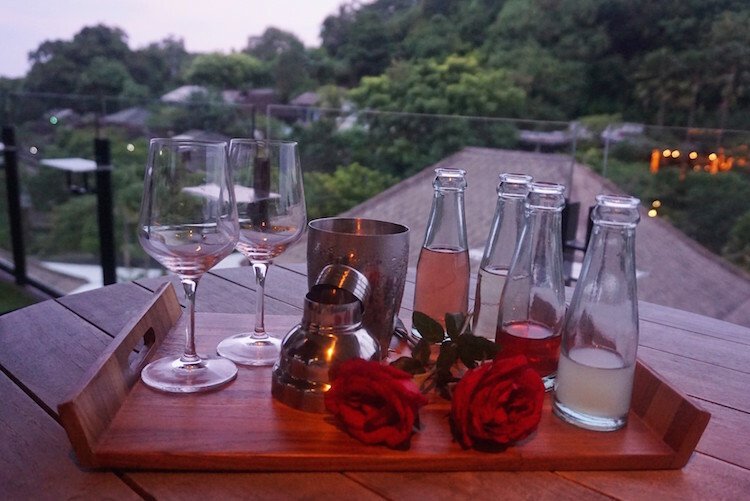 This Valentine’s Day in Bali is the chance to treat the person you love over an exquisite set menu, some wines, and some beautiful roses at The Trans Resort. A fancy Valentine’s set menu that features hand-selected ingredients inspired by the French cuisine has been meticulously prepared and beautifully plated by the resort’s romantic Executive Sous Chef Amaury Belkhanfar. With the support from his culinary team, led by Executive Chef Allen Stevano, a perfect Valentine’s set menu is served with love, passion and precision. The romantic evening here starts with an amuse bouche of “Asparagus, White Truffle and Crouton Royal” that will tantalise your taste buds before the starter of “Foie Gras en Terrine”. This special classic French delicacy served with pear and red wine, stimulating the refined delicatessens to the palates. Furthermore, be prepared with an unexpected flavour of “Bedugul Green Vegetables Tarlet and Parmesan Blanc Manger and Quail Eggs”. It continues with a charming pre-main course dish of “Risotto like a Bouillabaisse and Seafood Flambe au Pastis with French Rouille Sauce and Saffron Emulsion”. The flavourful and juicy “Pan Roasted Veal Tenderloin” is the choice for main course, served with Artichoke Barigoule, Roquette and Wild Parsley Cremeux, together with Pomme Dauphine and natural beef jus will definitely excite the senses. To end the Valentine feast, a special French “Caramel Tart” served with honeycomb, berried coulis, vanilla soil and raspberry sorbet is served before coffee or tea, and Petit Four. IDR 1,500,000++ per couple. Go above and beyond to tell your significant other how much you love them at The Stones this Valentines Day in Bali. 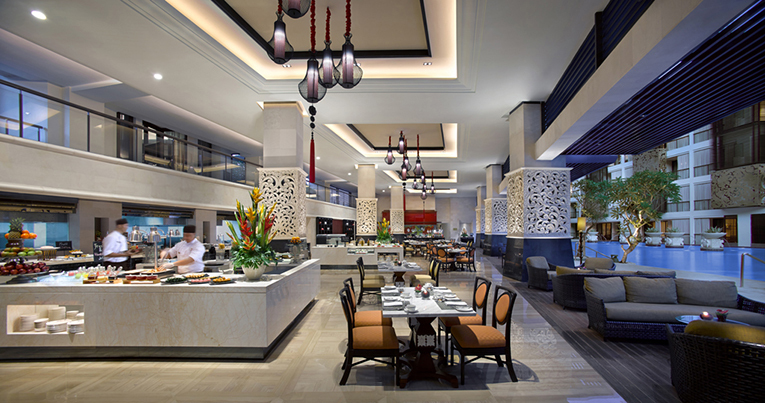 The resort’s Big Fish Bar & Grill offers a Valentine’s Day five-course set menu dinner to ensure that your heart – and tummy – will be filled with love during the special night (IDR 750,000 net per couple), or opt for romantic dinner at the resort’s Cabana (IDR 1,000,000 net per couple). Both romantic offerings come with a glass of sparkling wine for each. 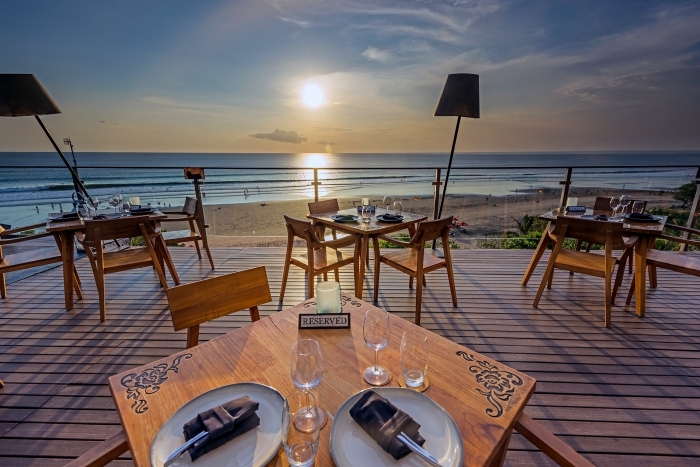 Treat that special someone on this Valentines Day in Bali, at this marvellous rooftop venue, offering an exquisite Peruvian chef’s table with a delectable four-course dinner, prepare for delicious Confit Pork Belly Chicharron, Cured Salmon Tataki, Confit Duck Leg and a Jivara Cremeux. On top of that, you’re invited to experience a “love potion” cocktail making for you both. The night will also include a heartwarming performance from the Manja Trio and Simon on Saxophone, playing in the background to add to those Valentines Day in Bali vibes. IDR 1,200,000 per couple. Famous for its food spreads and creations, Mulia Bali is throwing an understated elegance to celebrate Valentines Day in Balie. 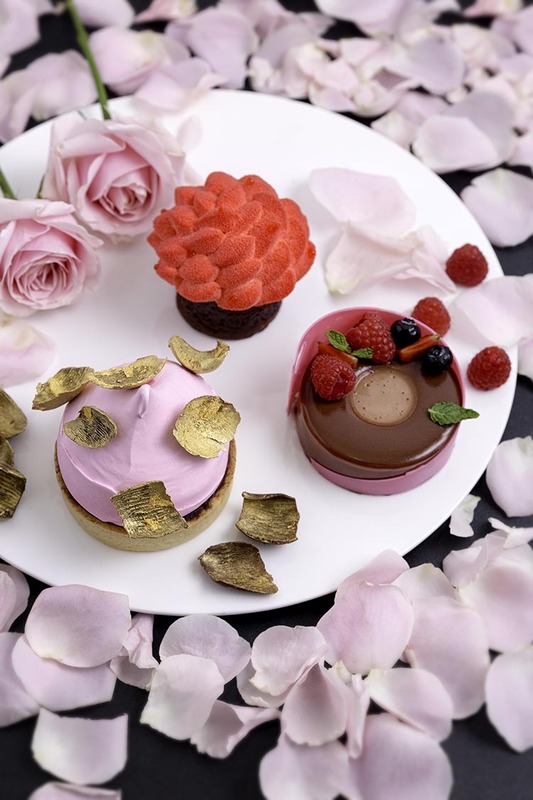 Indulge your beloved one with Mulia Deli’s signature Valentine Confections. Pamper her with homemade Chocolate Bonbons, Lovely Tarlets and many more hearty creations.